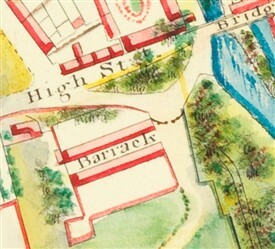 Detail of Barrack showing two rows of buildings. Note one of the original bastions has been removed. Date c.1825. MS 22014 Knox Estate Map NLI. An 8th King's Royal Irish Hussar. The Irish Parliament drew up plans for an extensive expansion of Army Barracks in Ireland in 1696, to maintain and increase their strength, after the Treaty of Limerick, was signed in Oct 1691. By 1710 over one hundred new barracks were built with two thirds being for the infantry, and one third for the cavalry. Athlone was built circa 1697, with the Ballinrobe Infantry Barracks taking over the Old Castle and grounds, located near the current Garda Station and Telecom Tower. A Barrack Board had been set up in 1701, to maintain, repair and build barrack buildings with the design and construction being the responsibility of the Surveyor General. The Ballinrobe property was reconfigured or rebuilt c 1700. The location on left off High Street, was on a prominent defensive site on high ground, which controlled the strategic passé or Bridge on the River Robe. This part of the old complex is now the site of the Telecom Tower, with offices and its high mast being visible from many miles away and across the lake at Tourmakeady. Msgr. T. Gunnigan suggests that on or close to this site, the Fitzgeralds had built the first of the Norman Castles in Ballinrobe c1350, and the deBurgos either purchased it or acquired it by marriage. "His manor house on the Robe was a strong stone castle with a surrounding wall, having bastions at the angles, and enclosing houses for his retainers… here he held his baron’s court… and his steward, acting in his name and with his authority tried both civil and criminal offences…and were assembled his armed retainers who for the lands they held not only paid rent, but were also liable when called upon to follow their lord into battle". This complex had a high perimeter, battered masonry wall, with angled bastion-shaped projections at diagonal corners (one was removed and is buried under the current Mound). 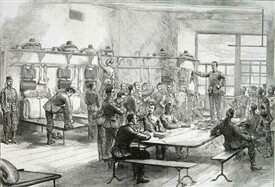 The interior layout had two, two storey buildings in a central position. There was a well within the compound and to the rear an infirmary. No doubt many changes occurred throughout its long history. An underground tunnel led across to the Kenny household. In an article in the Journal of the Galway Archaeological and Historical Society Mr. C. Ormsby supplied a list of the 45 Freeholders of the County of Mayo, assembled at the General Assizes, held for the said County at Ballenrobe [Ballinrobe] on 20th July 1716, to petition King George to secure for the Militia and other Protestants, an increase in height of 7 or 8 feet of the outward wall of the Barrack “which is now erecting in this Town in and near which place is a good stand of Protestants”. Mr. Ormsby goes on to say that: “this Town was made a Garrison and more particularly taken care of by the late King James [1633 –1701] (in the late Warrs [Wars] as being the principal place of securing this County”. 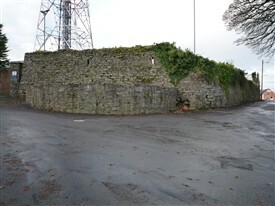 Hubert T. Knox of Cranmore, in his article in JGAHS argues that this petition was not for the fortification of the town but of the barracks "then being built". This is useful in establishing a date for the increase in development of an Infantry and/or a Calvary Barracks in the town. Another hint for early English occupation was the first English burials since Katherine Holcroft’s in 1668 occurring at St. Mary’s Church of Ireland graveyard, (now the local Library) being those of Hugh Evans in 1717 and William Smith’s in 1719. Significant developments would have occurred following the Jacobite Wars, with the arrival of the first permanent regiment, the 8th King’s Royal Irish Hussars,’’ nicknamed The Cross Belt,s stationed full time in Ballinrobe in 1700. This regiment, first raised in 1693, would have been composed originally of loyal Protestants who had fought at the Battle of the Boyne. The regiment’s title from 1693 would have been Colonel Henry Cunningham’s Regiment of Dragoons, the title later changing with the regiment’s Colonel’s name which was normal procedure at that time. A Captain Kenny, of Roxborough, Ballinrobe (b. 1702) was later in Colonel Cuff’s Regiment of Militia Dragoons. Landlords in a region, like the Cuffs of Creagh, must have had significant power and wealth to secure this Garrison for Ballinrobe, as there was fierce competition to secure a Garrison for various other towns. It both added to the Landlord’s security, and added to the social activities in a region. Also, realising the economic advantages of having one located on their estates, many landlords offered land, or volunteered to build the barrack themselves, and then rent it back to the British government. Its stratigic location would have make it an attractive prospect. "the manor-house, which through various vicissitudes and a succession of owners was falling into ruin, was formerly restored by James Cuff, a soldier. His descendant in the line of succession (who was the sole heir), James Cuff, High-Sheriff, restored, enlarged, and beautified the manor-house, which was again in a wretched state of collapse, and was falling down…"
Cuff’s descendants renovated this property in 1752 and subsequently sold it to the war office in 1821 for use as a Calvary barracks. Ormsby, C.C. 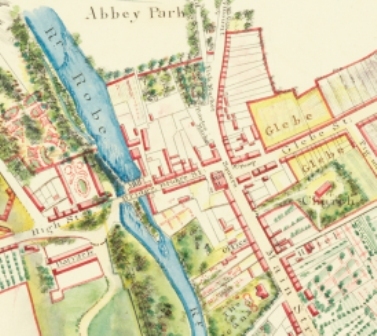 A Petition for the Fortification of Ballinrobe. JGAHS No 7- 1911-1912 pp 168-170. This page was added by Averil Staunton on 19/12/2010.